of the Abilities United family since Nick was six months old. Nick Golick is a happy, artistic and inspiring young man. 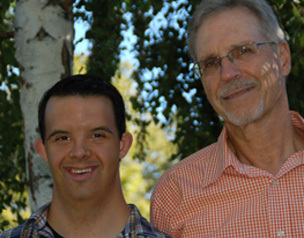 Born with Down syndrome, Nick started coming to Abilities United in 1982, when he was just six months old, and so began a lifelong relationship with the organization. Getting a job was the ultimate success for Nick. Abilities United helped Nick land a job as a Courtesy Clerk at Safeway, where he bags groceries, collects grocery carts in the parking lot, and helps around the store. He’s been there six years, and meets weekly with his Abilities United job coach to discuss how to continually improve his work. And we appreciate that Nick contributes to our community through dedication to his work, his beautiful artwork, and his positive attitude! Based on an interview with Nick and David Golick in 2012. Written by Bob Thomas. Edited by the Golick Family and Wendy Kuehnl.